Please welcome today's paranormal guest author Dianne Sylvan. Dianne is the author of the Shadow World series (Queen of Shadows, Shadowflame, Shadow's Fall, Of Shadow Born). Dianne: I've been writing almost as long as I've been able to write. The first story I remember clearly was in second grade; it was about birds. Most of my childhood writing involved talking animals. Pretty soon while other kids were playing sports, if I wasn't reading I was making up stories. Dianne: I've always been kind of a stereotypical Scorpio - occult and paranormal subjects have fascinated me since before puberty. Throughout junior high most of what I wrote was high fantasy - quests, unicorns, enchanted whatever - but when I got to college I stumbled into the world of fan fiction and next thing you know I was writing about vampires. Dianne: One of my characters is telekinetic; I'd love to be able to move stuff with my brain. Then I could stop wishing my cat would grow thumbs so he could bring me beverages. 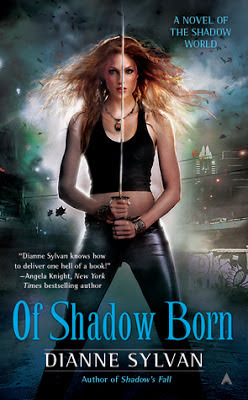 Dianne: Of Shadow Born is book 4 in the Shadow World series, which begins with Queen of Shadows. It's about a society of vampires, more specifically their ruling class. A lot of the story takes place in Austin, Texas, where I live. I think people enjoy the series because the vampires I write aren't the typical "I can't love you, you're human, please allow me to mope alone for all eternity" kind of vampires. They love what they are, and they fight to protect their own kind. The main character, Miranda, is a famous musician, and is a strong, smart woman - not perfect, but growing. Her husband is the most powerful vampire in the South but he's also a computer geek who loves ice cream. I think the characters are the main draw for readers - it's definitely all about how love and death and war change who they are and bring out the best and worst of them. Dianne: I've been thinking about this one forever! I actually have a Pinterest board where I collect pictures of people I think fit either the looks or the personality of my characters. Miranda, my heroine, bears a striking resemblance to Scarlett Johansson in Iron Man 2 - if you watch her fight scenes, she's physically perfect for the role. I still haven't found the right face for her mate David. I have a much easier time casting the smaller roles. The bad guy in the first four books, for example, is a dead ringer for Anderson Cooper. 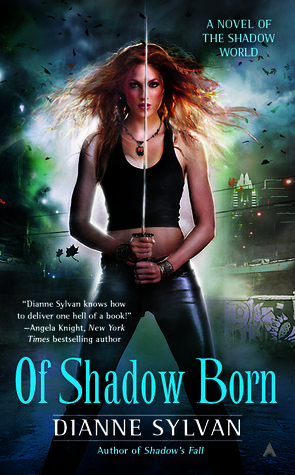 Of Shadow Born (Shadow World #4) by Dianne Sylvan. Thank you Dianne for joining us here today at From the Shadows! To learn more about Dianne Sylvan and her books, please visit her website. Is there going to be a 5th?